This is a good example of object photography that mimics the set up in a larger space. Just over and left of the little Smurf is a simple 3 joints table lamp with a metal conic shade and a 60w light bulb. 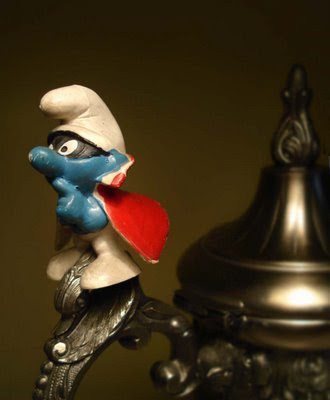 The lamp is so close that it acts as a big softbox for the metal mug on which the Dark Smurf is perched upon. The light is angled down so that the background (just a foot behind) does not receive direct light. Result: a nice light gradient. The bottom is a white table which helps diffusing light. Camera (an old Sony DSC-W3C) settings: ISO 160 f3.2 1/100th EV -1. The mug and the handle were de-focused with Gaussian Blur. I dodged the Smurf and the immediate background just a little bit. Got the Smurf on a trip to Friburg, Germany. I was six.